"You are the light, you are the darkness, you are the pain and the joy that my heart fills. You're something more than just words, you're something way much more. You are love, and all that the good Lord intended me to feel." I just finished reading @the_dailyTHIRST blog "The Committed Bachelor" and I was ashamed more than anything. Not at the fact that she has given up on love, but the fact that the same men that are suppose to nurture her, and make her a better woman, drove her to such actions. I'm not going to describe the stories she recalled, but each one made me upset. Upset because the growing trend of African American men degrading our African American women is so rampant. Our history is defined on the laurels of African American men standing up and making their way through the oppression and the struggle. When we stand up, and band together for the betterment of our people, nothing, and I mean nothing can stop us. But the reason why we stand up, the reason why we want better for our race, is because of that African American woman. To me the African American woman is the single most important thing to an African American male. When I think of the woman I marry, I think of a woman with more passion, honor, and love than I will ever know. Because it takes such a woman to make a king. Queens make Kings, Queens make kingdoms, Queens create forever. Now I would be lying if I sat here and said that I didn't think of being one of those dudes when I became discouraged with love or when I went through my fair share of heartbreaks. But there was always something that stopped me short of carrying our such actions. That one thing that always stopped me was the thought of feeling that true love that the lord intended me on having. HOPE, that's what drives me to keep pushing forward and learning from all the mistakes and wrongs that a person has bestowed upon me. Because that's the only way I could ever learn to love an African American Queen. Some men will never get that King status, and some women will ever get that Queen status. And that's quite alright, because that is life. I am far from perfect, but once I settle down and I learn from my mistakes, that turns into another small victory for a woman that I never met, or have met. To those women who feel that there are no men left in this day and age who want to take you to the highest peak of Mt. Everest and look at the scene, who wants to spend those nice cool, sunny afternoons in the park just eating and talking, who wants to just sit outside and look up at stars and talk about things. They are here, they are everywhere, but most of those men are princes, they have yet to become Kings. Kings are battle tested men who know the depth and magnitude of their rule, so their judgment, while not always concise, will always have much thought and effort behind it. I'm 27, I am not a King just yet, I fully believe that my next step will be onto that throne, and I will dawn the crown. 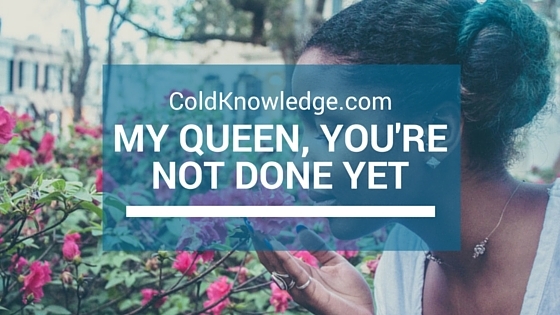 But it took me this long to know the full scope of what it means to love an African American Queen. It hasn't come without great lost, and without great sacrifice. The trials and tribulations by fire and judgment didn't melt away anything, it only forged a will to love you my Queen just as hot and as fierce as those fires that burned around me. I know your pain, I know the frustration you feel. I know your need to feel loved, I know your need to feel like the Lord has blessed you with the greatest man that you will ever meet. I know these things because I yearn for the same, and it's my job as your King to provide you with all those feelings, and I know once I provide you with that and more than you can ever imagine, I will have your the support and the backing of the greatest power outside of the Lord's, and that's your love. So I leave you with this my princess, pick your head up, you King is coming to make you a Queen.